The Cheesy Sausage Wonton Appetizers are one of our favorite appetizers. I make the sausage wontons a few times a year on special occasions. The recipe ingredients include cheese, ranch dressing, black olives, and sausage! Our granddaughter Tenley sometimes puts in a special request for them. You might want to whip a batch up for Holidays or maybe during Football season. I know. I’m not a food blogger. But, I do an awful lot of cooking during the holidays and I teamed up with some of my blogging friends to share our favorite party recipes. 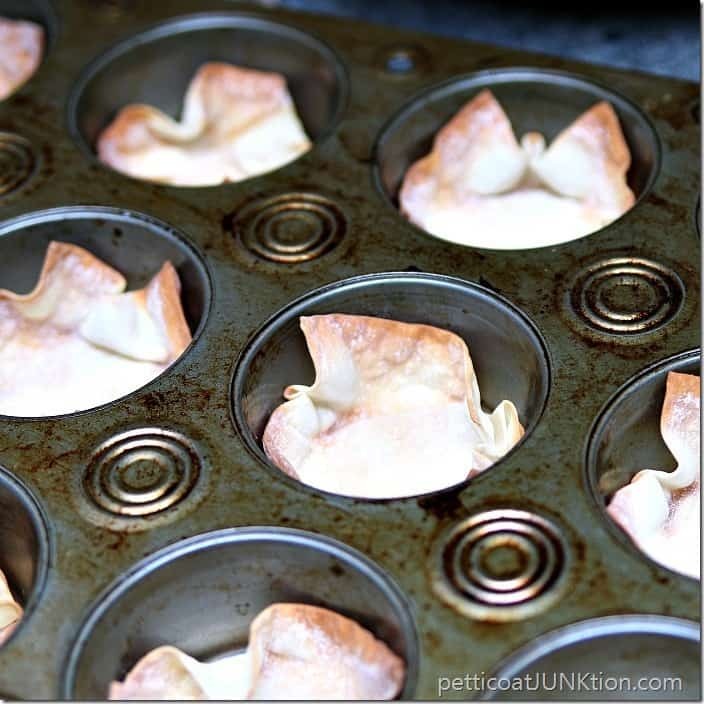 Preheat oven to 350 degrees F. Spray a muffin pan with cooking spray and insert wonton wrappers in the pan to form small cups. Bake for 5 minutes and allow to cool. Brown and drain the sausage well. 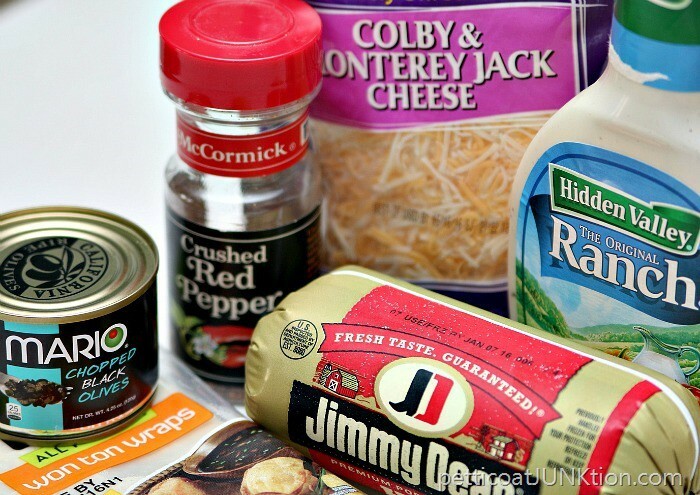 Combine the cheese, dressing, olives, sausage, and red pepper (if desired). 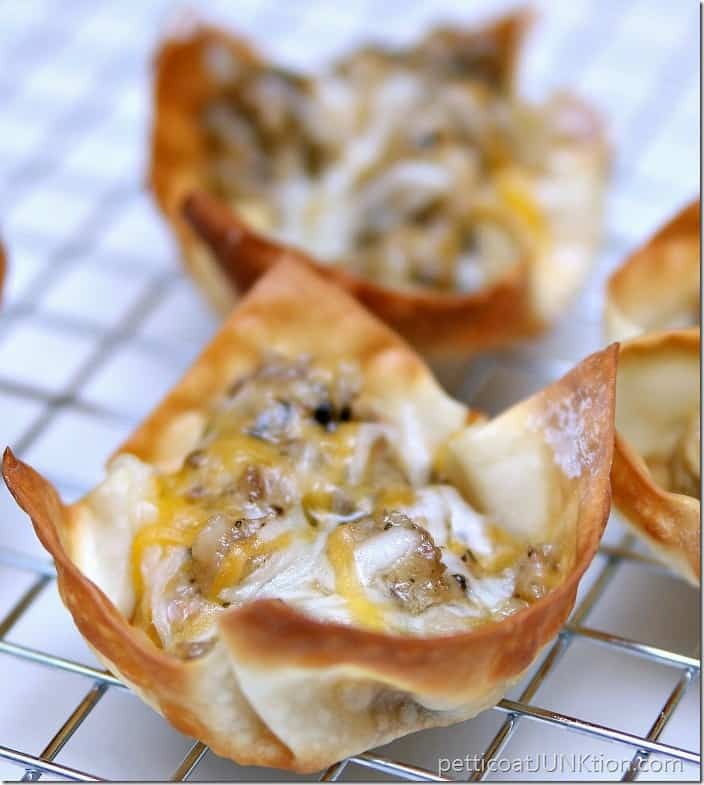 Fill the wonton wrapper cups with the mixture and bake for 5 to 10 minutes. Watch closely to keep the wrappers from getting too brown. Makes 36-48 wonton appetizers, depending on how much mixture you add to each cup. Cook the wonton wrappers until just brown. They will brown more when you cook them after the sausage mixture is added. You can tell my muffin pan is well used. It’s clean….just stained from cooking spray. Does anyone know how to remove that stuff? All that cheesy goodness. I brown the sausage and drain the grease by pouring the sausage in a wire strainer and patting with a paper towel. Once the sausage is drained I put it back in the pan and add the other ingredients. All that’s left to do is fill the wonton cups with the mixture and bake in the oven until the mixture is bubbly. You have to keep a close watch to keep the wonton wrappers from getting too brown….or burnt. One thing I found that helps keep the wrappers from burning is making sure your sausage cheese mixture is hot when it goes in the wrappers. So heat the mixture well or microwave it if it’s been refrigerated before putting it in the wonton cups. Then cook about 5 minutes or till good and hot. My friend Beverly introduced me to these sausage wontons. I started with her recipe and modified it over the years. I can’t even remember what her original recipe included. I do know that I cut the amount of Ranch Dressing in half. One cup was just too overpowering. I listed a can of black olives in the ingredients above but most times I only use half a can…..depends on how much you like black olives. You can also substitute regular sausage for the hot sausage. I have a lot of muffin pans so I cook all of the wonton wrappers at one time. They keep well in a plastic storage bag. The sausage mixture will keep in the refrigerator for several days. Just warm the mixture in the microwave until it’s hot, add it to the wonton cups, and cook in the oven until hot. If the wontons are for a party no worries….just make them all. If the wontons are just for me and hubby then we eat on them for several days. 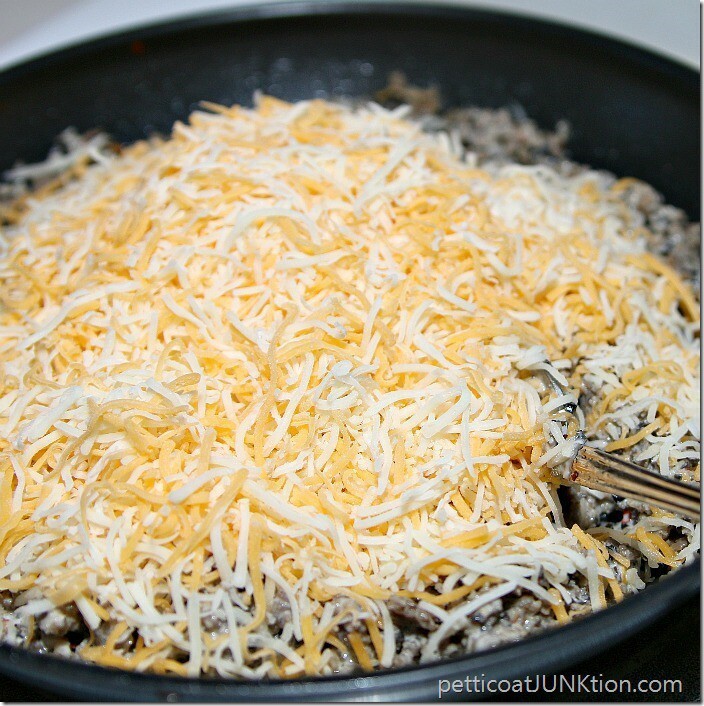 The cheese does make the recipe a bit rich so you don’t want to overdo the snacking. Do you have any favorite appetizers….or desserts? My family’s favorite cake is a definite winner. You can find the complete Italian Cream Cake recipe here. Another favorite is my grandmothers Banana Cake recipe found here. I like to cook, enjoy painting furniture, but I LOVE junk shopping. Get a look at my video below to see why…. Now it’s time to take the tour. Join me by clicking on the “pink text links” below. These look yummy! Thanks for sharing at #HomeMattersParty! What a fantastic and easy appetizer idea! I would probably leave out the olives, but that’s what is so great about this recipe: it’s easily adaptable to individual tastes! Thanks for sharing at Merry Monday! Your cheesy-sausage wonton’s look SUPER yummy! I’ll definitely have to try them! Thank you so much for sharing at the Wonderful Wednesday Blog Hop! PINNING!! Total yumminess! This is such an inspirational post. We would love it if you would share it at our What’s it Wednesday Party! Hope you can join us! These look yummy! And your directions make me think I could actually make them myself! Thank you again for organizing the tour… I’ve picked up lots of new ideas for the new year! Everything t these look yummy! Thanks for hosting such a great round up!!! I love one bite appetizers! They are perfect for parties. These look amazing. They would even make a great breakfast on the go. I really like the portion size so that you can “try” and only eat one if you are watching what you eat. Great recipe. Can’t wait to try it. Hi Kathy, these look and sound so delicious, can’t wait to try them. These look awesome!! Looking forward to giving them a try. These look amazing and I will add these to my recipes. Looks great!!! My family would love these Kathy… pinned! Sounds delicious! Will have to give them a try! These look so good I think my kids will love them! Yep, I saw your post on Instagram and had to check to see if your recipe was similar. It’s the same one I use. They are yummy! Oh my gosh, Kathy! I MUST make these. I really like Jimmy Dean sausage but someone locally makes the best sausage I’ve ever eaten. So I can’t wait to try it in your recipe. Thanks for hosting this party and Happy New Year!!! I have made similar ones using chicken and salsa- yours sound even tastier with spicy sausage. Yum! Oh my! These look so good! 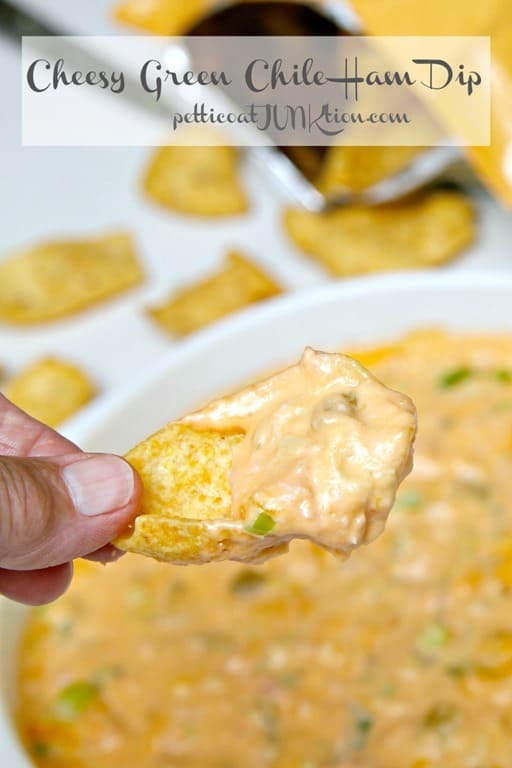 Great game day recipe! Thanks for sharing! These look so good! I know that a batch of these would be a hit at a party or for watching the next game. My husband loves sausage and if I made these, any leftovers would be gone in no time. These look delicious! My family will love these for our next party. These look delicious, Kathy! 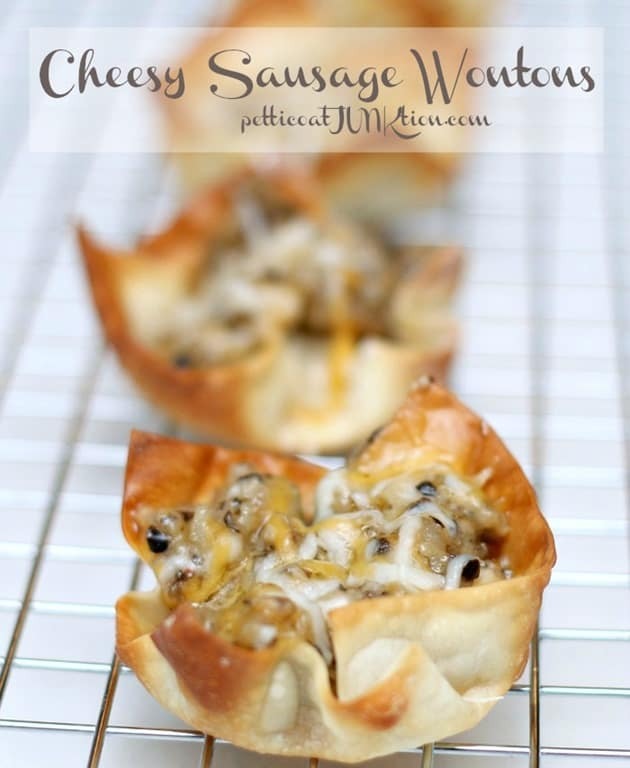 Sausage is my hubby’s favorite, I’ll have to try these for New Year’s!